Grant, we beseech thee, O Almighty God, that we, who, through our weakness, faint under so many adversities, may recover by the passion of thy only begotten Son. Who with thee and the Holy Ghost, liveth and reigneth, God, world without end. Amen. This morning, also, Jesus goes with his Disciples to Jerusalem. He is fasting, for the Gospel tells us, that he was hungry (St. Matt, xxi. 18). He approaches a fig-tree, which is by the way-side; but finds nothing on it, save leaves only. 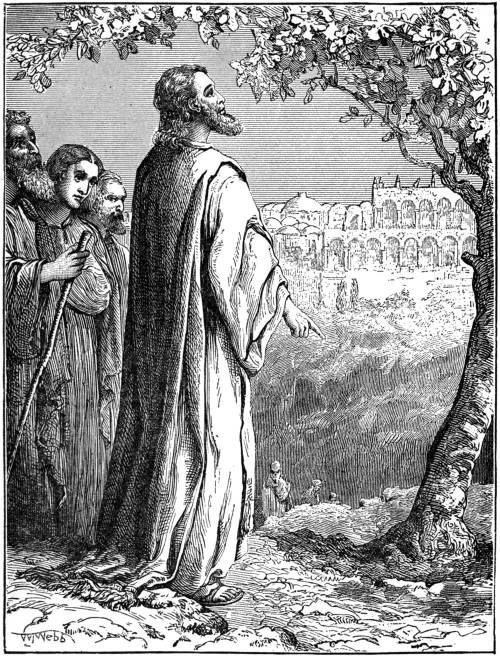 Jesus, wishing to give us an instruction, curses the fig-tree, which immediately withers away. He would hereby teach us what they are to expect, who have nothing but good desires, and never produce in themselves the fruit of a real conversion. Nor is the allusion to Jerusalem less evident. This City is zealous for the exterior of Divine Worship; but her heart is hard and obstinate, and she is plotting, at this very hour, the death of the Son of God. The greater portion of the day is spent in the Temple, where Jesus holds long conversations with the Chief Priests and Ancients of the people. His language to them is stronger than ever, and triumphs over all their captious questions. It is principally in the Gospel of St. Matthew (Chapters xxi, xxii, and xxiii), that speaks of our Redeemer, wherein He so energetically accuses the Jews of their sin of rejecting the Messias, and so plainly foretell the punishment their sin is to bring after it. At length, Jesus leaves the Temple, and takes the road that leads to Bethania. Having come as far as Mount Olivet, which commands a view of Jerusalem, he sits down, and rests awhile. The Disciples make this an opportunity for asking him, how soon the chastisements he has been speaking of in the Temple will come upon this City. His answer comprises two events: the destruction of Jerusalem, and the final destruction of the world. He thus teaches them that the first is a figure of the second. The time when each is to happen, is to be the measure of iniquity is filled up. But, with regard to the chastisement that is to befall Jerusalem, he gives this more definite answer: Amen I say to you: this generation shall not pass, till all these things be done (St. Matth, xxiv. 34). History tells us how this prophecy of Jesus was fulfilled: forty years had scarcely elapsed after his Ascension, when the Roman army encamped on this very place where he is now speaking to his Disciples, and laid siege to the ungrateful and wicked City. After giving a prophetic description of that Last Judgment, which is to rectify all the unjust judgments of men, he leaves Mount Olivet, returns to Bethania, and consoles the anxious heart of his most holy Mother. Lesson from Isaias the Prophet. Ch. L.
In those days, Isaias said: The Lord hath opened my ear, making known his will to me, and I do not resist: I have not gone back. I have given my body to the strikers, and my cheeks to them that plucked them: I have not turned away my face from them that rebuked me, and spit upon me. The Lord God is my helper, therefore I am not confounded. He is near that justifieth me, who will contend with me? let us stand together. Who is my adversary? let him come near to me. Behold the Lord God is my helper: who is he that shall condemn me? Lo, they shall all be destroyed as a garment, the moth shall eat them up. Who is there among you that feareth the Lord, that heareth the voice of his servant? He that hath walked in darkness, and hath no light, let him hope in the name of the Lord, and lean upon his God. But let us hearken to the last words of our Epistle: He that hath walked in darkness, and hath no light, let him hope in the name of the Lord, and lean upon his God. Who is this but the Gentile, abandoned to sin and idolatry? He knows not what is happening at this very hour in Jerusalem; he knows not that the earth possesses its Saviour, and that this Saviour is being trampled beneath the feet of his own chosen people: but, in a very short time, the light of the Gospel will shine upon this poor Gentile: he will believe; he will obey, he will love his Redeemer, even to the laying down his life for him. Then will be fulfilled the prophecy of the unworthy Pontiff [Caiphas, the high priest of that year], who prophesied against his will that the death of Jesus would bring salvation to the Gentiles, by gathering into one family the children of God, that hitherto had been dispersed (St. John, xi. 52). Sequel of the holy Gospel according to St. John, Ch. XII. Jesus, six days before the Pasch, came to Bethania, where Lazarus had been dead, whom Jesus raised to life. And they made him a supper there; and Martha served, but Lazarus was one of them that were at table with him. Mary therefore took a pound of ointment of right spikenard, of great price, and anointed the feet of Jesus, and wiped his feet with her hair: and the house was filled with the odour of the ointment. Then one of his disciples, Judas Iscariot, he that was about to betray him said: Why was not this ointment sold for three hundred pence, and given to the poor? Now he said this, not because he cared for the poor, but because he was a thief, and, having the purse carried the things that were put therein. Jesus therefore said: Let her alone, that she may keep it against the day of my burial; for the poor you have always with you, but me you have not always. A great multitude therefore of the Jews knew that he was there; and they came not for Jesus’ sake only, but that they might see Lazarus, whom he had raised from the dead. The Church brings this episode of the last days of our Saviour before us, because it enables us to have a clearer understanding of the history of the Passion. Mary Magdalene is a figure in the Passion and Resurrection of her Divine Master. She is the type of a soul that has been purified by grace, and then admitted to the enjoyment of God’s choicest favours. It is of importance that we study her in each of the several phases, through which divine grace led her. We have already seen how she keeps close to her Saviour and supplies his sacred wants; elsewhere, we shall find Jesus giving the preference to her over her sister Martha, and this because Mary chose a better part than Martha; but now, during these days of Passiontide, it is her tender love for Jesus that makes her dear to us. She knows that the Jews are plotting Jesus’ death; the Holy Ghost, who guides her through the different degrees of perfection, inspires her, on the occasion mentioned in to-day’s Gospel, to the performance of an action which prophesied what she most dreaded. One of the three gifts offered by the Magi to the Divine Infant, was Myrrh; it is an emblem of death, and the Gospel tells us that it was used at the Burial of our Lord. Magdalene, on the day of her conversion, testified that earnestness of her change of heart by pouring on the feet of Jesus the most precious of her perfumes. She gives him, to-day, the same proof of her love. Her divine Master is invited by Simon the Leper to a feast: his Blessed Mother and his Disciples are among the guests: Martha is busy, looking after the service. Outwardly, there is no disturbance; but inwardly, there are sad forebodings. During the repast, Magdalene is seen entering the room, holding in her hand a vase of precious spikenard. She advances towards Jesus, kneels at his feet, anoints them with the perfume, and wipes them with her hair, as on the previous occasion. Jesus lay on one of those, which were used by the Eastern people during their repasts. Magdalene, therefore, could easily take her favourite place at Jesus’ feet, and give him the same proof of her love as she had already done in the Pharisee’s house. The Evangelist does not say that this time, she shed tears. St. Matthew, and St. Mark add, that she poured the ointment on his head also. Whether or no Magdalene herself understood the full import of what the Holy Ghost inspired her to do, the Gospel does not say; but Jesus himself revealed the mystery to his Disciples, and we gather from his words that this action of Magdalene was, in a certain manner, the commencement of his Passion: She, in pouring this ointment upon my body, hath done it for my burial (St. Matth, xxvi. 12). The fragrance of the Ointment fills the whole house. One of the Disciples, Judas Iscariot, dares to protest against this waste, as he calls it. His base avarice deprives him of feeling and respect for his Divine Master. His opinion was shared in by several of the other Disciples, for they were still carnal-minded. For several reasons Jesus permits Magdalene’s generosity to be thus blamed. And firstly, he wishes to announce his approaching death, which is mystically expressed by the pouring of this ointment upon his body. Then, too, he would glorify Magdalene; and he therefore tells them that are present, that her tender and ardent love shall be rewarded, and that her name shall be celebrated in every country, wheresoever the Gospel shall be preached. And lastly, he would console those whose generous love prompts them to be liberal in their gifts to his Altars, for what he here says to Magdalene is, in reality, a defence for them, when they are accused of spending too much over the beauty of God’s House. Let us prize each of these divine teachings. Let us love to honour Jesus, both in his own person, and in his poor. Let us honour Magdalene, and imitate her devotion to the Passion and death of our Lord. In fine, let us prepare our perfumes for our Divine Master: there must be the Myrrh of the Magi, which signifies penance, and the precious Spikenard of Magdalene, which is the emblem of generous and compassionating love.